Each month, Ananth (a.k.a Rango) and I will hit up a local restaurant and write about one specific dish. Once the plate reaches the table, there’s absolutely no talking about it or any facial expressions. We go home, write separate reviews, and post them right here. We decided to check out Veggi Deli this month. Yet again, I drew the short straw and found myself stuck eating a meal with Kevin. In all seriousness, when we started doing our write-ups together, Veggi Deli was one of the first places I suggested. Location wise, if nobody told you that this establishment existed in the back of a small grocery store (Asian Groceries, same shopping complex as TJ Maxx and the DMV), you wouldn’t ever stumble upon it. 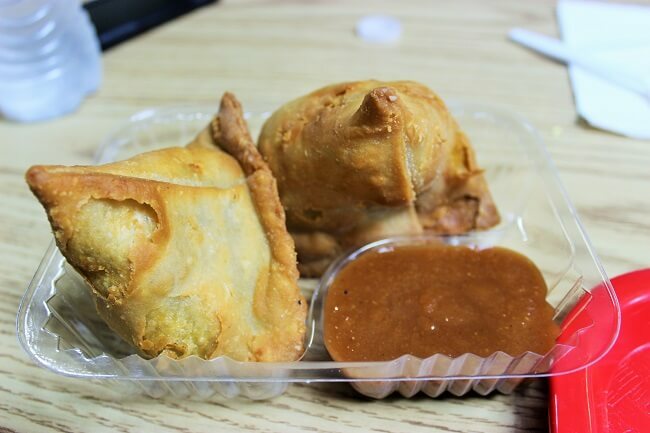 Veggie Deli offers something very unique to the Indian food scene: South Indian Cuisine and street food-style snacks. We had a few other delicious bites during this meal, but my personal pick as the center of this review was the Mysore Masala Dosa. The best way to describe this dish is a savory thin crepe stuffed with potato curry and a spicy tomato chutney and was served with a coconut chutney and sambar (think spicy tamarind and vegetable/lentil soup). The dosa was cooked exactly how it should have been, crispy and thin. The potato curry was seasoned well, albeit, it suffered slightly from a lack of salt, as did the sambar, but that may have been just my nature for liking foods a little saltier. A pinch of salt later, and I almost felt like I was eating lunch at my parent’s home. The coconut chutney tasted like my mother made it fresh, and was absolutely delicious. 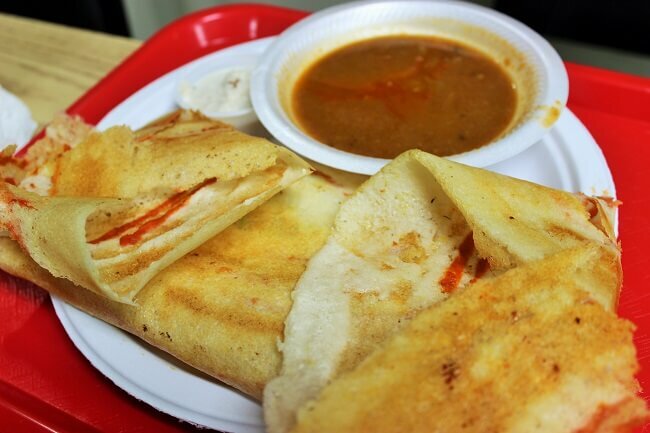 For folks that are not a fan of spicy food, omit the Mysore masala-dosa, and opt for the plain Masala dosa. Same dish, just without the spicy tomato chutney inside the dosa. More than describing the taste, which words absolutely fall short on, my advice is to just drop in and give it a try. At less than $5, you will no doubt get a unique and tasty food experience. I’d heard good things about Veggi Deli in the past, so when Rango suggested we go there for lunch, I was pretty stoked about checking it out. Truth be told, I love places like Veggi Deli … little hidden gems that not many folks know about. This place, located in the very back of Asian Groceries, definitely fits the bill. I’ll cut right to the chase. I loved everything about our lunch, so much so, that I broke the golden rule for this series and actually expressed my exuberance to Rango during the meal. Sometimes rules are meant to be broken. 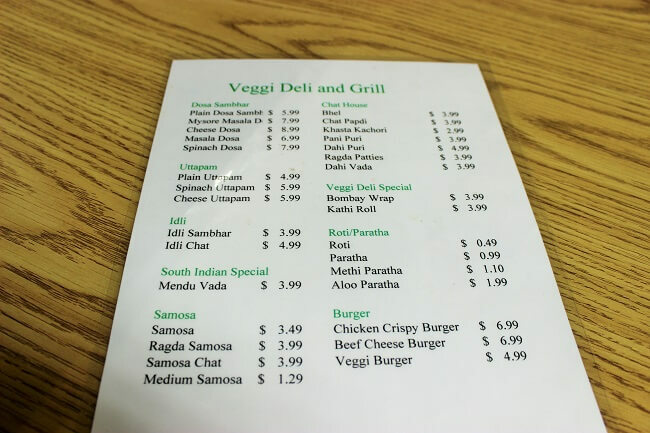 Veggi Deli is a no-frills, 4-table dining area where you order at the counter and wonderful Indian food is ready within minutes. The centerpiece of this review is the Mysore Masala Dosa, a crispy thin, crepe-like concoction filled with potatoes and a slightly spicy tomato chutney, but it would be remiss of me not to mention the other dishes in our meal, like the vegetable samosa and bhel. 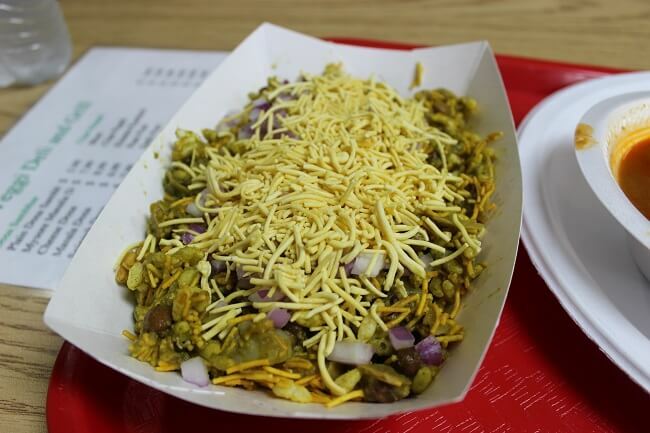 Oh, that bhel … talk about the perfect snack! A little sweet, a little spicy, and just a little tart, the bhel was comprised mainly of potatoes, onions, and spices but topped with these crunchy noodles that took the entire dish to another level. It’s a must-order. But back to the dosa. It too was outstanding, just not a dish I would crave like my tablemate obviously did. Dude polished off the entire plate within minutes. My only knock on the dosa and the accompanying sambar was a lack of salt, which wasn’t all that big a deal. Veggi Deli is a winner.